I recently attended my best friends Star Wars themed Birthday Party. 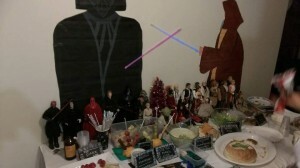 All the food was amazing, as it was also inspired by Star Wars. What amazed me the most was how big a hit the fruit was with the kids despite all the other party food available. There were six different types of fruit displayed in a rectangle Tupperware container. Green grapes, red grapes, watermelon sliced into small pieces, strawberries in halves, fresh pineapple pieces and mandarin pieces. Skewer sticks with the ends wrapped in aluminium foil – to resemble lite sabers, were placed in a cup for each guest to fill it with fruit of their choice. At the front of the Tupperware container, a skewer for each type of fruit was displayed. It was bright and interesting. Over the coming hours the children at the party had such interest and fun with the fruit lite sabers. They would stand around and make up their own lite sabers and were having competitions to see who could come up with the most interesting combinations. They were also coming up with different patterns and combinations with the fruit on the sticks. I was amazed at how popular the fruit was with the kids despite other less nutritious party food being available. Such a great idea just had to be shared with my readers. Thank you Angela for such a great idea to make fruit more interesting and a party hit for adults and kids alike.